← The “Passive Investor” Paradox. No-one Is Really A “Passive Investor”. If you don’t understand debt growth you can’t understand the US economy or markets. As the chart above shows, the lesson of 2008 was that even a minor rest from debt growth can bring down the current financial system. 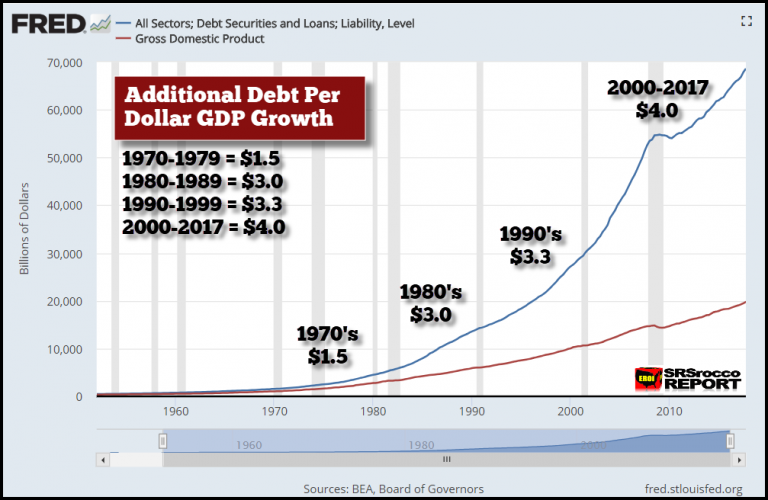 The problem is, however, that each unit of GDP growth is taking an accelerating amount of debt production! Somewhere there is a limit to this relationship between debt and growth, and it looks like the US has decided to find out where that is! The US is high on debt drugs. Already, the US economy has been in a new altered state since 2008. There is now no growth at all excluding Treasury debt financing! The chart below shows this astonishing paradigm change. 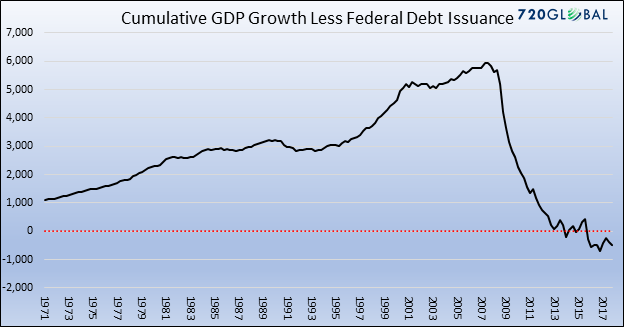 Ever since 2008 Federal debt has remained consistently in excess of GDP every single year. This debt commitment is apparently now an essential component of policy making. 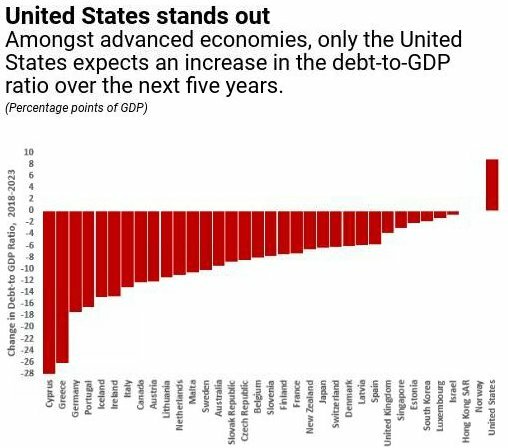 As the IMF recently warned, amongst advanced economies only the US is still expecting to increase debt/GDP over the next 5 years. Beyond Federal debt we see the same equation everywhere else. 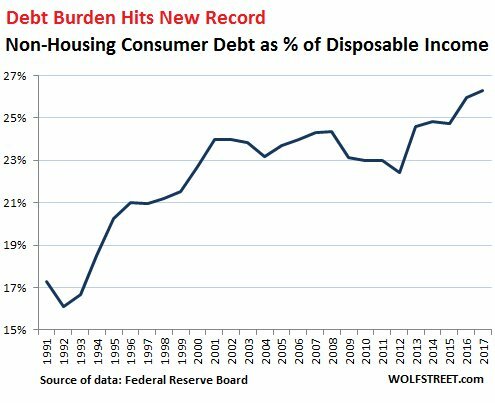 Excluding housing debt, which had its own spectacular bubble around 2008, consumers have also found a way to take debt to new extremes. Corporations have shown a similar pattern. The first chart below shows they have once again reached extremes only seen just prior to recessions. 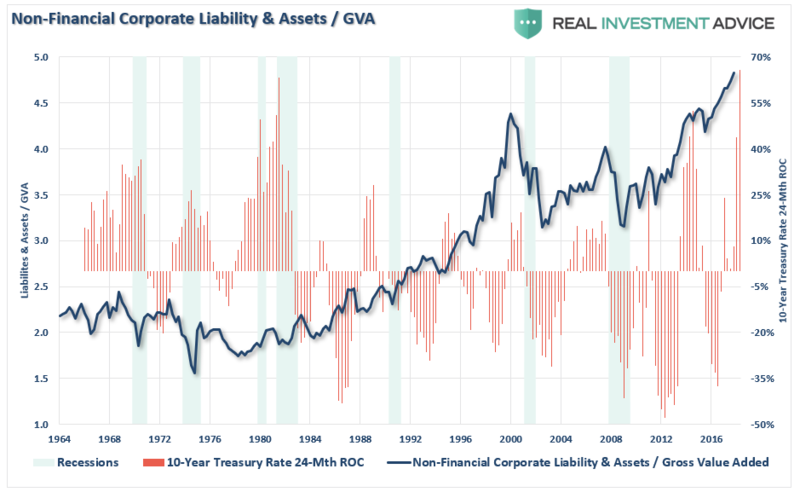 The following charts show that in addition credit quality has been deteriorating for the last 4 decades, while balance sheets have become increasingly leveraged as companies have bought back record amounts of their own equity, making new records in the first quarter this year. 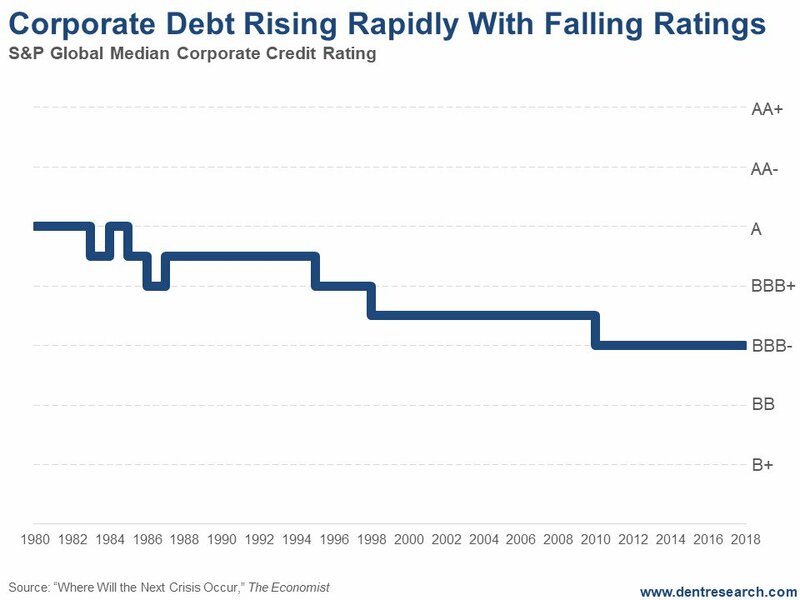 Across the whole economy the US has become more indebted than ever before, and with increasing leverage, and declining credit quality. 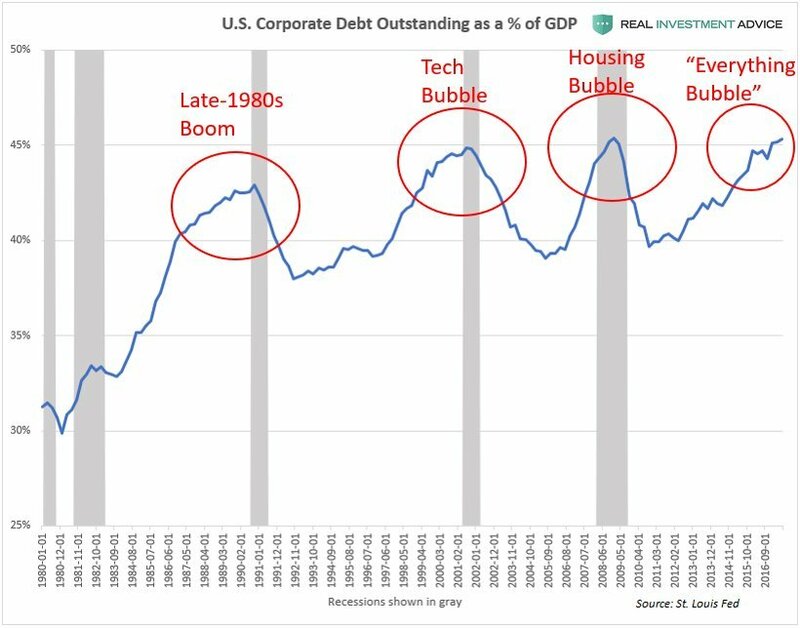 John Hussman provides excellent analysis of this situation for those who want to go into much greater depth on these explosive debt dynamics. In short, over the past 10 years, the government, corporations, and consumers alike have loaded up on record amounts of debt they have virtually no chance of paying back. There is no doubt a huge amount of this debt will go bad, and another crisis will likely follow. For one, as we’ve discussed many times, the Federal Reserve is now raising rates and withdrawing stimulus with QT for the first time since this boom began. Part of the “tide” that helped drive this bubble is now going out. With so much debt the greatest stress is interest rates. 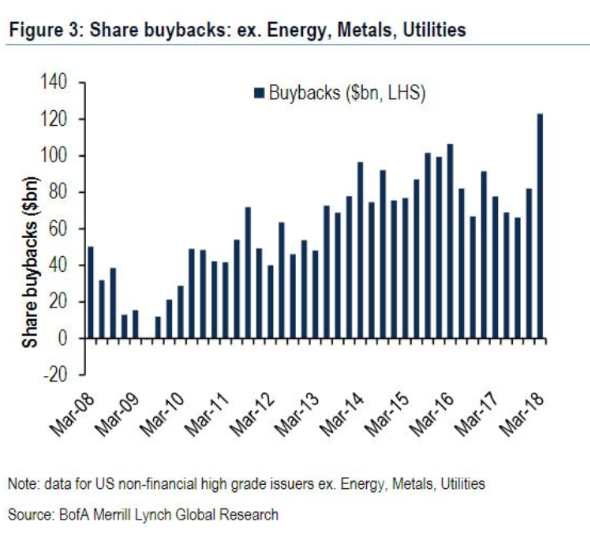 This is most clearly seen in the chart below where both corporate balance sheets, and the change in the 10 year Treasury yield have just reached all time high peaks above the levels of 2000 and 2008. Now the risk spread has started to widen. The risk spread in the bond market has “broken out” to a new high point on the chart. That could be an important signal of a trend change in corporate interest rates. 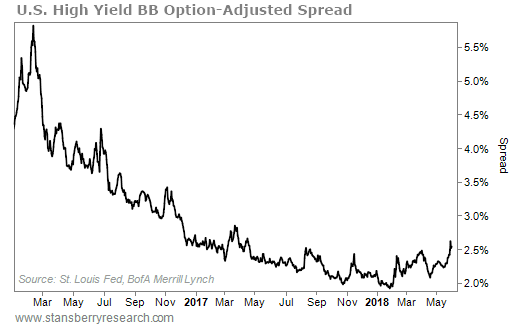 The spread is currently greater than 250 basis points (2.5%). That’s roughly a 25% increase off the lows. According to the data from the Federal Reserve, credit-card delinquencies at the 100 largest U.S. banks sit at 2.5% today. This is up from a low of roughly 2% in 2015, but again, it is well below levels that have warned of previous crises. However, delinquencies at all other banks outside the top 100 have soared from less than 3% in 2015 to more than 6% today. This is actually higher than delinquencies at the same banks during the peak of the last crisis. Likewise, Bloomberg data show credit-card charge-off rates at the top 100 banks has risen from less than 3% to 3.7% over the past three years. But at all other banks, charge-offs have nearly doubled from roughly 4% to 7.6% today. The continuing debt explosion has to continue to accelerate to sustain the ultimately unsustainable economic dynamic. We can’t know when it will end, but in the mean time sufficient amounts of debt can continue to drive the economy. However, the upside momentum is falling as the debt impact is in decline, the global economy has peaked, and the fed is tightening more than ever since 2008. 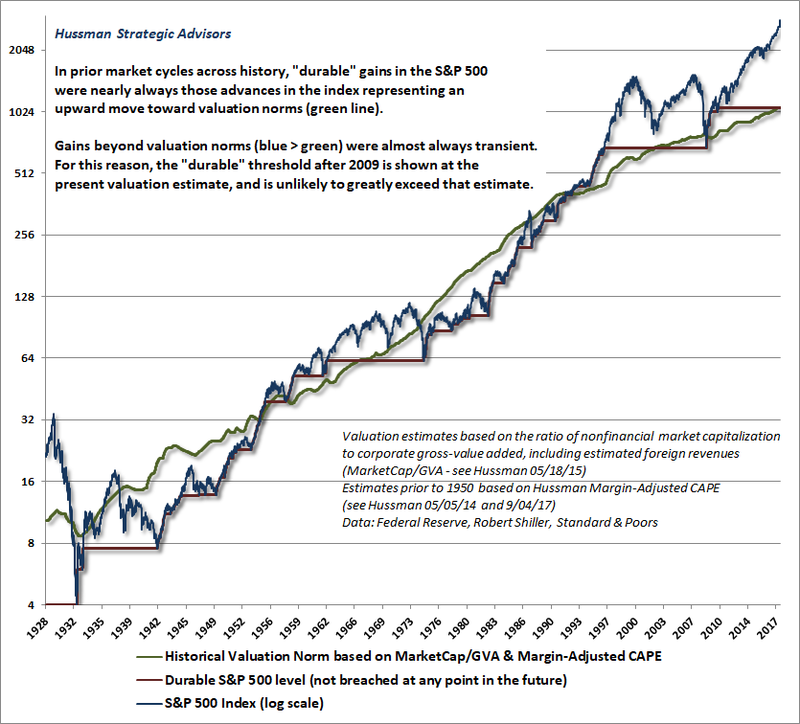 At the same time the downside is enormous, with the market some 70% above valuation norms. In January and February, we saw how fast the market can fall. Around 10% in just a few days. Typically bear markets are more volatile than bull markets. With so many investors committed to passive investing, and little experience of a bear market, the shock to investor’s wellbeing could be far greater than many currently envision. The debt work out will be devastating as record debt will have to be resolved in very difficult economic conditions. Unfortunately, many investor’s priority is chasing short term gains. Record numbers of passive investors have even abandoned the idea of risk management altogether. If market upside can only result from even greater debt infusions producing only minor transient gains, why should that be the priority? Investors need to widen their perspective and remember that massive drawdowns permanently damage your long-term wealth and prosperity. The priority should be to avoid that outcome, and only then to maximize near term returns within that constraint. Does your investment plan prioritize capital preservation or are you chasing an overvalued market floating on an unsustainable debt explosion?